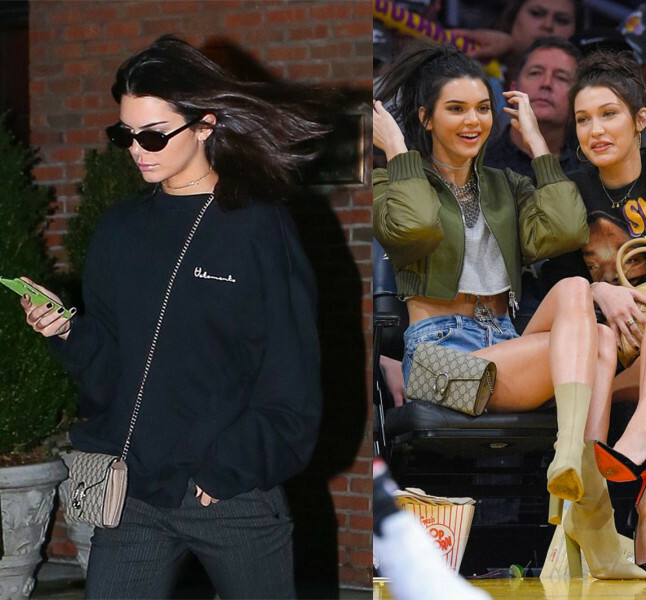 Kendall Jenner roamed the runways for Alexander Wang 2018 Spring/Summer Show, and she did advertising shoots for Tod’s 2018 Spring/Summer collection, Ochirly 2018 Spring collection and more. She attended 2018 Vanity Fair Oscar Party. If you referred to her personal data, you would praise her success. The girl born in 1995 has an enviable rich family, perfect shape and a beautiful face. Kendall is honored as the queen in Instagram, full of hot topics. Her photos in street style win many likes. Her clothes and accessories she wore often are symbols of fashion trends. 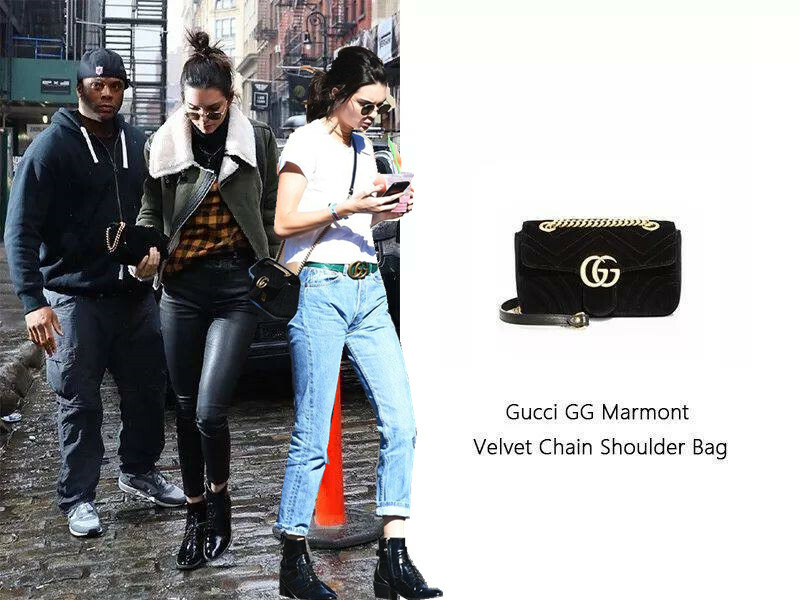 Let’s learn how to dress up from Kendall Jenner’s Gucci bags. GG Marmont bag, especially the small or mini style, is light and chic. We often see it in celebrities’ street style. 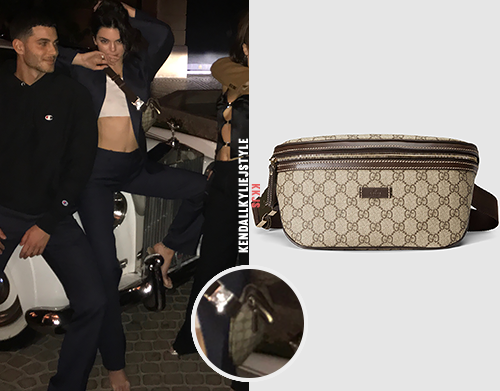 Most female stars wear a Gucci GG Marmont small/mini bag across the body or over the shoulder, but Kendall creates a new and chic way. She puts the chain into the bag or removes it from the bag, then she holds it in one hand. Especially in the winter, you are in heavy clothes and a bag, so to hold your mini bag in one hand is a good way to show your chic look. 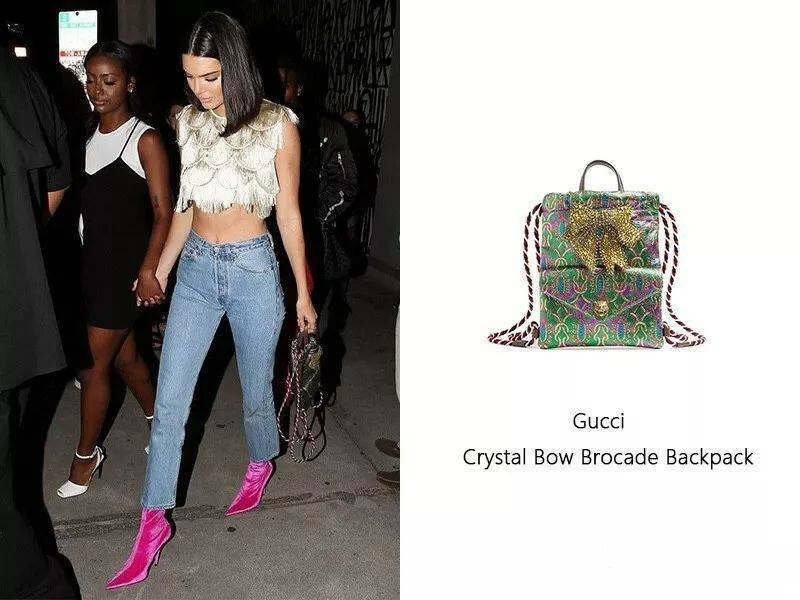 She had a Gucci Crystal Bow Brocade backpack in 2017 Gucci show, and the bag is very luxurious and gorgeous. It’s made of brocade and crystal. Not every girl can hold the fancy price and vintage style. Although during the short journeys, Kendall is still in fashion style. Gucci GG Supreme Canvas Carryall bag with red trimmings and red Web strap. Born in Gucci 2015 Fall/Winter Show, Gucci Dionysus small GG shoulder bag is the most popular “it” bag in three years. It’s the first purse designed by Alessandro Michele after he became an Italian fashion designer appointed creative director of Gucci in January 2015. The bag’s name came from the Geek God Dionysus. The Dionysus collection features the tiger head buckle. Many female stars wear Dionysus bags in different styles. The classic and simple style is easy-matching for any outfits. Kendall Jenner often wear it. In recent years, belt bags are very popular with the whole world. Belt bags in different materials and styles show celebrities’ fashion and charm. Whether on the waist, across the body or over one arm, they are trendy.